Regular readers know we like to introduce items we've been hitting, swinging, stroking, wearing, reading, eating, drinking, and watching in recent weeks, especially if we think they're any good. Here are a few products we've been trying recently that you might like. The second I pulled this shirt out of the box my heart sank. The color/pattern wasn't my favorite, and the collar appeared to be stiff, like that on a shirt worn by a 1970's gangster with chunky gold rings on his chunky fingers, and a ghastly gold necklace sat on his chest. If there's one thing I can't stand, it's stiff collars. The collar is actually soft, and the 65% Pima Cotton/35% Polyester blend fabric extremely light and comfortable. So it probably isn't a good fit for the '70s gangster, and nor is it one of those ultra-modern shirts featuring moisture-wicking technology, mesh ventilation in the shoulders, and all the rest of it. It is simple, elegant, refreshingly low-key and unpretentious. The design still wouldn't be my first choice perhaps, but a quick look at the company's (founded in Los Angeles in 2013) web site, reveals a number of other styles I'd be very happy wearing on the golf course, if not out to dinner and elsewhere around town. First impressions are supposed to last of course, but my first impression of this shirt could not have been more wrong. The models on the company web site appear to be in their early to mid-30s, but I can see golfers from 17 to 70 wearing these threads. Definitely a keeper. The shirt shown is the Matthew which has recently been reduced to $59.99. When Jack Nicklaus talks about how he used back-weighted clubs to win 18 majors you tend to listen. Used them since he was a boy, he says, didn't like hitting clubs without the weight, he says, you'll definitely feel the difference, he says. Well then, makes sense to try it at least. The Secret Grip, developed by Boccieri Golf which invented the Heavy Putter and consequent line of Heavy clubs, weighs 92g - about 40g more than a typical grip. That sounds like it's enough to dramatically effect the speed and tempo of your swing, but actually the difference is quite subtle. Yes, the club does feel ever so slightly heavier but not siginificantly so. So what is it supposed to do, and why did Nicklaus like the weight so much? In a YouTube interview, the Golden Bear says he has no idea how it works and can't explain the theory. But he is adamant it has a very positive effect on a golf swing. It slows the hands for starters, allowing the transition from backswing to downswing to happen more rhythmically than it otherwise might. And though it makes the shaft feel slightly stiffer, it actually has the effect of making it softer enabling you to get the ball up in the air more easily. Nicklaus said it also helped him shape his shots, and produced a tighter dispersion area. It is about accuracy and consistency, Nicklaus says, not distance necessarily. However, Boccieri adds that in tests he discovered golfers added about four miles an hour of clubhead speed, probably due to the more efficient transition. I'm very happy with my current driver so didn't want to replace the grip. So I put the Secret Grip on my previous driver - a Ping i20 - and took it out for a spin. I don't hit the ball any great distance, and probably not far enough to hit terribly wayward shots. I normally hit nine or ten fairways. First time out with the Secret Gripped-driver, however, I hit 13, and the one I missed was by a couple of inches. Yes, the fairways at the course I played were pretty generous, but I did it again a few days later at a different course. I didn't hit the ball any further, but I was significantly straighter. And it was so much fun hitting iron shots off the fairway all afternoon. 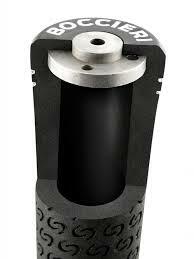 The Secret Grip retails at $12.99 and can be fitted onto any brand of club. I thought Jack Nicklaus was opposed to the modern golf ball, and how far it flew. So I was quite shocked when his company introduced a range of three modern golf balls late last year - White, Blue, and Black. These balls weren't 1.62 inches in diameter, made of balata or gutta-percha, and didn't possess some low-tech dimple pattern that ensured they flew only 75% as far as contemporary balls. No, according to the Nicklaus web site, they "OUTPERFORM other top of the line golf balls. Each ball incorporates the most CUTTING EDGE multi-layer technology to achieve the OPTIMAL COMPRESSION for the level of player it is designed for"
So not only was Nicklaus now making balls that compared favorably with the modern balls he despised so much, his were actually better (according to the web site anyway). Despite the apparent irony of the situation (the irony increases when you hear Nicklaus golf balls are actually manufactured by Bridgestone), these balls do have two redeeming qualities that should ensure their success. Three actually. First, they are cleverly distinguished by their color which corresponds to the set of tees players play from. The Nicklaus Black is ideal for low-handicappers with high swing-speeds who play from the back tees. The Nicklaus Blue is for those with average swing-speeds who play from the middle tees, and the Nicklaus White is great for seniors, women, and juniors with slow swing speed who use the forward tees. "We decided to make three golf balls based on the tee markers that one would play," Nicklaus says. "We know your swing speed from which set of tees you choose. This is paramount when identifying the right ball for you. But no matter the percentage of players who know, or don't know, their swing speed, 100 percent of them know the tees they play." This should help alleviate some of the confusion surrounding your decision over which ball to play. Second, a percentage of sales is donated to the Nicklaus Children's Health Care Foundation. 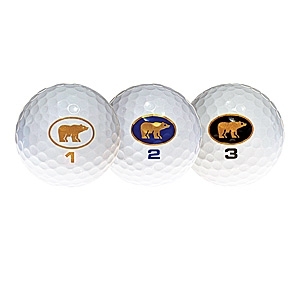 Nicklaus balls are sold at a premium price ($50 a dozen for the Nicklaus Black, $46 for Blue and White) at over 200 Nicklaus-designed courses throughout the USA. They are also available online for a greatly reduced price ($32 Black, $28 Blue and White) but with a request for voluntary contributions to the Foundation of up to $20. Third, these balls are actually pretty good. I've been using both the White and Blue and have been impressed with their distance and feel - not discernably better than other balls of similar price perhaps, but certainly as good.